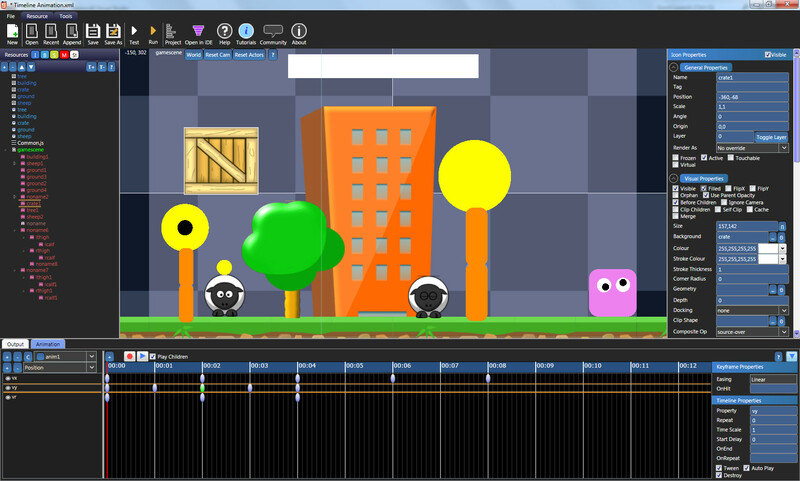 In the editor, each object (scene or actor) can have its own set of animations. For an example showing a project creating using the animation editor see the Timeline Animation demo. What is the Animation Editor? The Animation Timeline Editor is the section of the editor that is located to the bottom of the screen (the tabbed area that contains Output and Animation tabs). In the timeline editor you can create and edit Flash style animations that occur over time. Scenes and Actors (Sprites and Labels) can be animated over time by creating animations, adding properties and then creating key frames for those properties. A key frame represents the state of a specific property or set of properties at a specific point in time. A property is a specific attribute of the object such as scale, rotation, position etc.. Note that you can add custom properties by adding a timeline for an existing property then editing the property name in the timeline property view. Add / Remove property buttons and property category selection box – These allow you to add new properties and remove old ones from the animation. To add a new property, select the property from the property drop down box then click the “Add property” button, this will add a new property to the timeline and insert a key frame at time 0 in the timeline. To remove a property from the timeline, select the property in the animation property list then click the “Delete selected property” button. Key frames and timelines have a variety of different properties which can be adjusted that affect how the animation behaves when played back / exported. Now click the play button to play back the animation. You will see that the sprite will move from its original position to the new position over the space of 5 seconds.